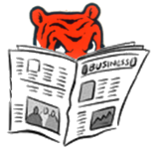 A Paw on the Media: Tigers ... in ... Space! Congratulations to the Auburn University Student Space Program! "Communication with the satellite is a main focus for the group. The CubeSat’s scientific purpose will be to measure gamma rays produced by high-altitude thunderstorms. Radio waves produced by antennae on top of Allison Laboratory will carry commands in the form of strings of zeroes and ones to microcontrollers on the satellite, which will then execute the given commands." According to the report, AubieSat-1 will be the first student-built CubeSat (a 4-inch cube satellite) to go into space on an American rocket. ... Tiger Motor Company on Opelika Road? ... the "rocking chair theater"? ... Woolworth's (in the mall)? ... when you couldn't go all the way from the mall to S. College Street on University Boulevard? ... the Winn-Dixie where Hastings is now located? On the Plains, rolling goes with Toomer's Corner. The intersection of College Street and Magnolia Avenue is the place to be when one of Auburn's sporting teams wins, especially the football team. 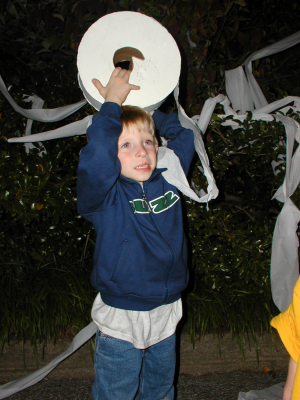 Celebration Auburn-style involves hundreds of yards of toilet paper. Auburn fans travel for miles to participate ... I have even travelled from my home in Prattville, Alabama just so I could join in the excitement. These photos are from a rolling in 2003. The toilet paper, draped from the trees, is pretty impressive in and of itself, but it's even moreso with the addition of fire. Someone had the bright idea (no pun intended) to set the toilet paper on fire. One of my favorite parts of being an Auburn graduate is The Auburn Creed. It is a wonderful, and wise, statement of how one might approach life. It speaks to the importance of understanding one's place in the world and what one might expect from - or expect to give - the world. It speaks to the importance of education: how one must prepare to play a responsible role in society. It speaks to the expectation that one approach life responsibly. It speaks to value of hard work. It speaks to what we mean to one another, not necessarily from compulsion but from grace. What magnificent guidance and counseling for how to live a right life. Just like marching down the field and scoring a touchdown, the Tigers are also marching through the television listings and making their presence known. Continuing the annual tradition, Auburn's game against Alabama is also slated for broadcast. I'm thinking that, surely, the Arkansas, LSU, Mississippi or Georgia game (or more than one of them) will be picked up as well. All of this media exposure is great for our team ... and fun to watch! I love Auburn football. Not in that crazy, infatuated, "I love you as long as you do what I want" sort of way. Rather, in the real sort of way that one loves family members: a love filled with pride and happiness when the Tigers play well and win, but also an unconditional love filled with concern when our team is having a rough time pulling things together and, forbid, lose. Every season, though, I do wonder how our team will fare on the field. Will it be a break out year, like 2004, or will the Tigers be (painfully) rebuilding? Or will they position themselves somewhere in between? Although the guys have had some erratic quarters of play, I am proud (and pleased) that they have reached down into themselves to win the four games they have played so far. Their performance in the South Carolina was spectacular. If only the three fumbled balls could have come back their way. And need I spread praise for Cam Newton? Not that I am a fortune teller, but I told Dad after the game that, either by design or fate, Cam seems to be laying a foundation for a Heisman nomination. I was pleasantly surprised when I saw The Birmingham News' story Sunday morning on that very topic. This week, Auburn cracked the AP Top Ten, at position 10. As I had hoped, our players are maturing on the field each week. I'm looking forward to seeing what kind of show they can give us in the coming weeks. "Jordan-Hare Stadium was an incredible experience due to a raucous crowd, a fantastic gameday environment and a gorgeous eagle that swooped over the stadium and sat on the sideline. The crowd chanted the entire game, but there were no rude catcalls toward USC or untoward motions to the fans, at least from our vantage points. "This small town was the best of the best. Before the game, friends told us all the campus was like Clemson. Not true. This place was pristine with class. It had character. And the people had character. They even recycled." I noted yesterday the changing face of Auburn over the years and landmarks that have taken their place in history. Today, The Birmingham News reports from Auburn that the university is gearing up for a building program to replace (or perhaps renovate) several buildings that are nearing the end of their "useful life": Haley Center and Parker, Allison, Funchess, Upchurch and Spidle halls. Many people absolutely hated Haley. The layout of Haley is sometimes confusing and the '60s architecture is a bit cold. As a liberal arts major and (later) an employee of AU, though, I spent a lot of time in Haley Center. I have always liked it ... at least since my first visit there in the early '70s when my parents took me and other family members up to the Eagle's Nest. I have a lot of good memories from time spent in Haley. I have to admit though it just hasn't been the same since the university restricted access to the Eagle's Nest and the areas on top of the shorter quads. I also have good memories from Funchess. My grandfather's brother was a professor of horticulture with his office in Funchess. Sometimes he would take me and my brother to Funchess to his office or to the coolers where he and other researchers kept lab specimens. The Birmingham News story mentions that Auburn may consider renovating and modernizing some of these buildings rather than replacing them. I would like to see Haley preserved and modernized if possible. I'm nostalgic like that. Are there any buildings or other locations on campus that you have particularly fond memories of? Please share in the comments. I, and I am sure others, would enjoy reading about them. I love Auburn. I don't mean just the university, although I certainly love AU. It's a complete package. Auburn, the city; Auburn, the university. I love Auburn and I have for a long time. I'm sure my own "Tiger Walk", if I may borrow that name, began before I was even born. Mom's family is from DeKalb and Jackson Counties in rural northeast Alabama. Her brothers were members of Future Farmers of America and used to visit Auburn with that group. Her dad's brother eventually became a professor of horticulture at Auburn. I'm not sure of other family connections to the university, or the town, before my birth, but afterward, Auburn was to become my family's home. In the early '70s, Dad was stationed there with the AU Air Force Reserve Officer Training Corp program. That lasted a few years, then Dad received orders and we moved away. When we moved away, Auburn was still part of a me, as reflected in my schoolhouse art (see at right). Not that we could watch the team play football often. But I had that frisbee. Mom and Dad left the Auburn plate on the front of our station wagon and the Auburn decals (see below) on the side windows (including an "A" zone sticker for my Dad; who knew the zoning system had been around that long?). Moving back to Auburn in 1980 was like a homecoming. Yes, as a teenager changing schools - especially at that dynamic time of entering junior high - there were challenges. But our family had some roots from living there before. My grandfather's brother was still teaching at the university. Some of my friends (and a teacher) from my days at Grace Methodist's preschool and Dean Road Elementary School remembered me. Fast forward to 1986. I became a full-fledged member of the Auburn Family. I was finally an official part of campus life, not just a town kid making his way to the computer lab or library from time to time. Haley Center. RBD. The Eagle's Nest. Momma G's. Toomer's Drug Store. (Remember Mac Lipscomb?). Glendean Drugs Sani-Freeze. Jordan-Hare: towering daily; rambunctious on game day. Rolling Toomer's Corner. Some of the great landmarks are gone, like the Kopper Kettle, Glendean Drugs, Sani-Freeze and the Tiger and War Eagle theaters (not to mention the "rocking chair" theater). Some of them have changed: a new student union; a coffee shop in RBD; the university, years ago, repealed unrestricted access to the observation deck on atop Haley, day or night, to enjoy the view. But the town and the campus remain beautiful, comfortable, energizing. Yes, Auburn, the town, and Auburn, the university, have grown and changed over the years. But at heart, they are still the same. At heart, they are still home.